Part of the show Should we fill Tyres with Nitrogen? Make the kitchen towel wet with your hot water but don't scrunch it up. Swish hot water around one glass and then lay the kitchen towel over the top. Swish hot water around the other glass. Pour it out and place the second glass upside-down over the first. Try picking up the top glass. 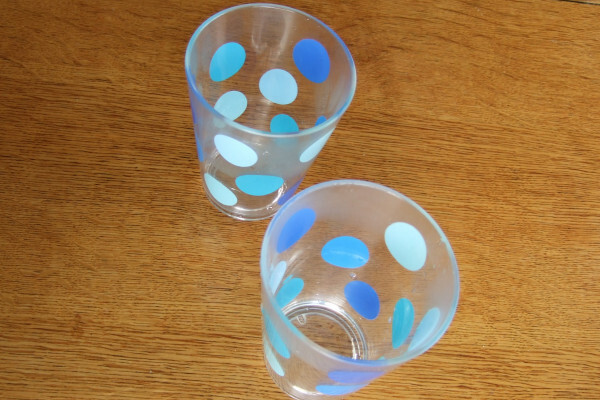 You should find that when you pick up the top glass the bottom one is stuck to it quite firmly. When you heat up air its pressure increases, pushing the air around it out of the way so that it expands. When you swish the hot water around the glasses it heats up the air inside. This air expands and some escapes. So you have slightly less air in the glass than was present at room temperature. When you let the air cool down its pressure will drop also. However, the glasses are sealed together with the damp paper and no more air can get in. This means that the pressure inside the glasses is lower than outside and the glasses are pushed together. When the air inside is hot the pressure inside and out are similar, making it is easy to open. As the air cools its pressure reduces so it is less than that of the surrounding air and the two cups are pushed together. This is the reason why it is so hard to open a new jam jar. The jam is put into the jar when it is boiling hot so air expands out of the jar and is replaced with water vapour. When the jam cools the air pressure reduces anyway and the water vapour condenses: reducing the pressure even more. It's the air pressure outside, pushing the lid on really tightly, making it hard to open. Why does air pressure increase when you heat it up? Air is a mixture of gases so it is made up of small molecules which are free to move. They are crashing into things all the time and in each of these collisions they push the object they have collided with back slightly. As there are billions and billions of air molecules all these tiny pushes add up to what we call air pressure. If you heat air up you give the molecules more energy, they move more quickly, collide with things more often and each collision is more violent. With hotter air the effect of all these collisions is greater, the air pushes on everything it touches harder and the air pressure goes up. A gas molecule hitting an object will bounce off and push the object back If the gas molecule is moving faster the push will be larger.